My kids LOVE lollipops. They always have. When they were younger, if we were doing something stressful like a doctors appointment or waiting in long line ups at the bank, I discovered the secret weapon to getting them to stay calm and focused was a lollipop. Between Developmental Trauma Disorder in my youngest and a severe anxiety disorder in my oldest, discovering the power of a lollipop was life changing for all of us as we tackled stressful situations. To this day they still love a good lollipop. So when my mom suggested we make our own lollipops I thought it was a brilliant idea! My boys are now much older and more mature than those little boys who struggled with such big emotions and feelings. They have developed confidence and strength from the adversities they faced. Now they can go into stressful and scary situations and talk about those emotions and feelings. We can work on breathing strategies and preparation techniques that will help them cope. But even to this day, if offered a lollipop, especially when they are feeling a little on edge, my boys will jump at the chance. I think it is cute and it is a wonderful reminder of how far they have come. What I love best though, is that they are now old enough to enjoy the idea of making their own lollipops and exploring the science behind how they are created. They have become great little scientists and that embrace their curiosity and passion for learning. Especially when candy is involved! Now, I’m not the most talented in the kitchen. My mom has made some amazing recipes for not only our family but also to share with our STEAM Powered Family. So I’ve passed the keyboard over to her on this one to share her wisdom on how exactly she made these lollipops with her grandkids. If you are new to our Candy Science series I highly recommend you take a moment to read this article on the science behind candy making. 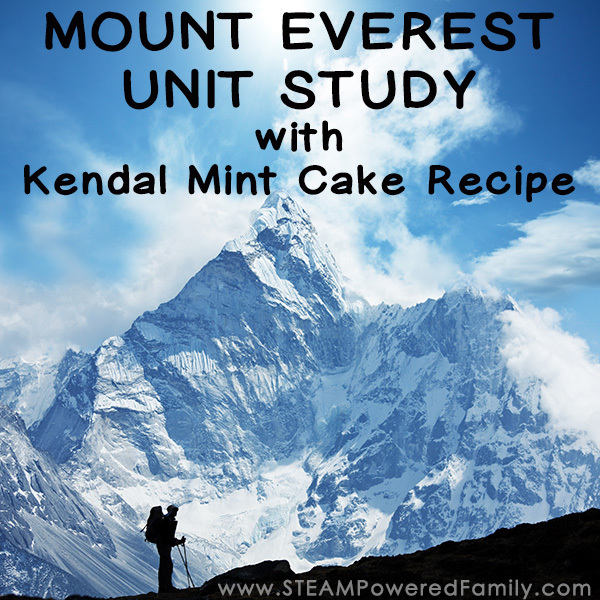 It explores the chemistry, the effects of temperature, terminology, crystallization and so much more. 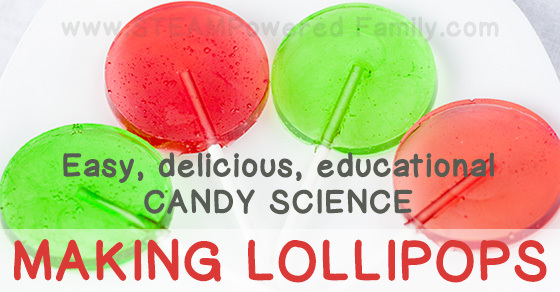 Knowing the science behind the creation of lollipops and other candies is fascinating for kids and helps to build their interest in science. Specific to lollipops, heating syrup to 295-300F (146-150C) is a process that results in 99% of the liquid being removed from the syrup. The result is mostly sugar in a clear solution that lends itself to hard candies like lollipop and glass candy. A word of warning: At these temperatures we very close caramelization which occurs at 320F. If you reach caramelization your lollipops won’t work. A proper candy thermometer is a must. Another word of warning: These homemade lollipops are quite hard and meant to be sucked on, not chewed. Be very cautious of your teeth! 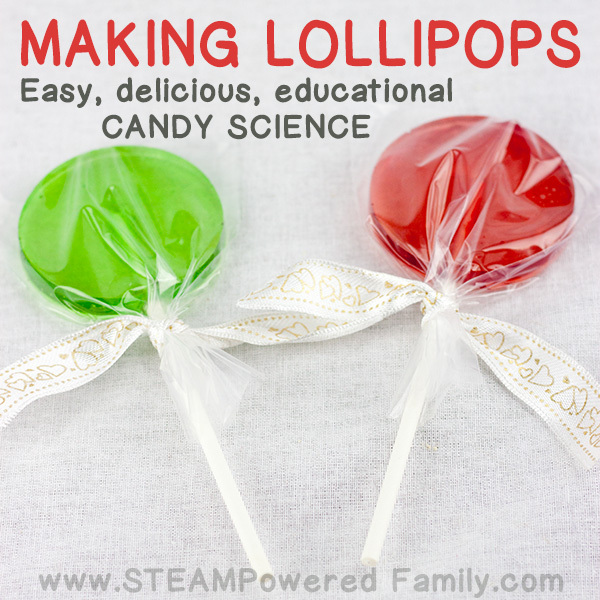 This Lollipop Candy Science Recipe will make 6 to 12 lollipops depending on the size of your molds. Add the 1 cup of sugar and the glucose stirring until the sugar dissolves and the water is clear. Continue to boil without stirring until the syrup reaches 295 degrees Fahrenheit (146 Celsius). Although the temp we are aiming for is 300F you will find that the syrup will keep cooking after you take it off the heat. Removing it from the heat at 295F ensures you don’t over heat the syrup and start the caramelization process. Remember this is very hot and can cause serious burns. A responsible adult should be doing all the pouring activities or actively assisting and involved with older kids. Let cool until the solution stops bubbling. Add the flavor and coloring of your choice. You can transfer the syrup to smaller heat safe containers if you want to make a selection of colors and flavors. Spray the molds lightly with the oil then place the sticks into the molds. Use a spoon to carefully fill the molds with syrup. Allow to cool completely and then carefully remove from the molds. Enjoy your Lollipop Candy Science Creations! Got leftover lollipops? 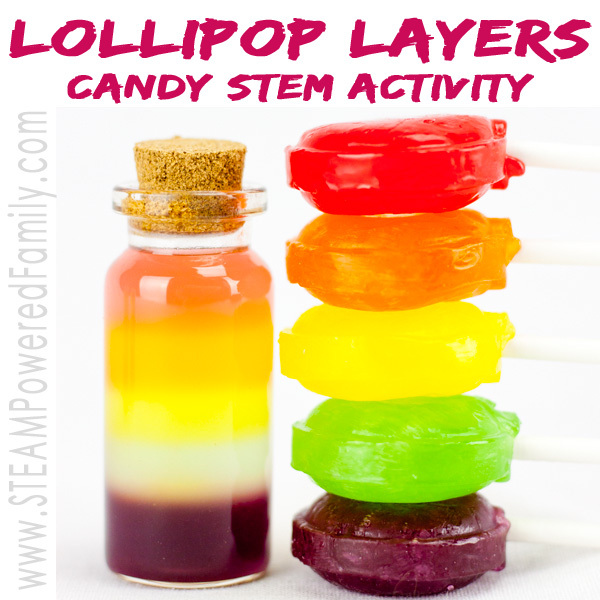 Why not try a Lollipop Layers STEM Challenge? 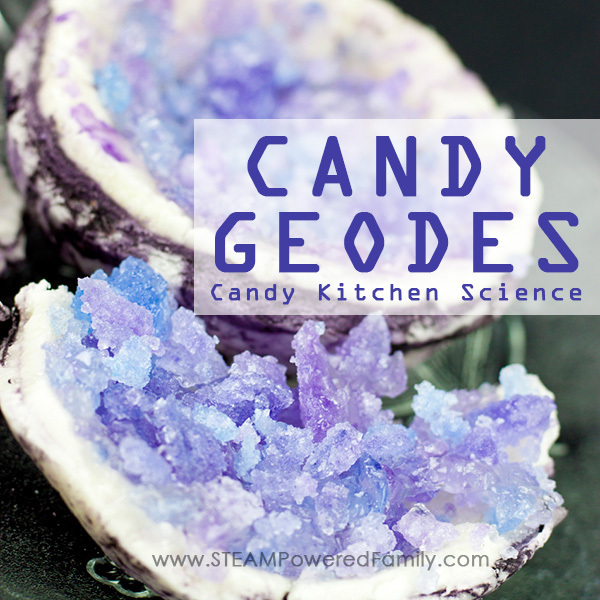 Want to learn more Candy Science? 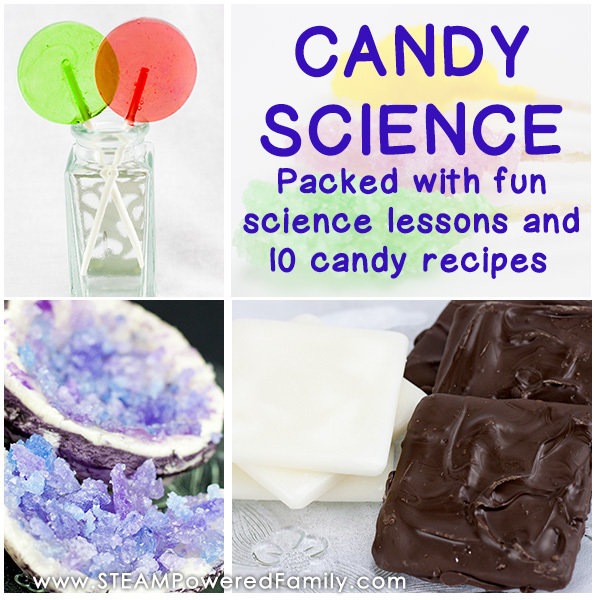 Check out all these great Candy Science projects from STEAM Powered Family!